Toyark sponsor HobbyLink Japan is having a sale on a bunch of Medicom Toys. 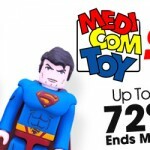 Here’s some hot Medicom action for you! This great sale features items from Star Wars, Ultraman, Disney, JoJo’s Bizarre Adventure, and much, much more. For the listings and ordering info, please see HERE!